Adventures of the Hex Machine: A what now? It's better to not have a title than have one that carries no meaning to it. Scenarios are a new thing, sure, but the title doesn't need to speak of them. It could have been something more adventurous, something in the style of the Explorer. After all, the characters aren't really doing anything known as 'completing scenarios' in Azeroth, and I think titles should reflect the characters' adventures - even though they are sort of on the edge. A character also wouldn't know they have the title 'Light of Dawn' or whatever. All in all, I simply find the title Scenaterdist a stupid and unnecessary stain in an awesome-looking expansion! Urgh. We are getting awesome titles in Mists of Pandaria, too, though. I like the sound of the Fearless, the Relic Hunter, Seeker of Knowledge, the Tranquil Master and the Undaunted. Farmer can be quite nice for roleplaying purposes! I immediately though of Blue Overalls and a pitchfork. No title can ever match Slayer of Stupid, Incompetent and Disappointing Minions, though. Oh, what is this? Activity! On another note: I am just simply loving cross-realm zones! I hadn't paid much attention to the feature until I noticed that Dalaran looked a bit more like an actual city again, with more than a maximum of two people around. 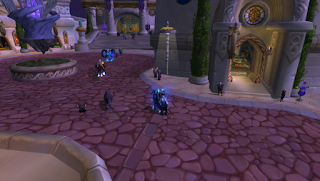 Some people stood at the auctioneers, RP'd in the streets, fished from the fountain and just made the place look less dead. I was very happy to notice this. It appears that Moonglade was "merged" with at least three other RP realms: Steamwheedle Cartel, Darkmoon Faire and Earthen Ring. I have no negative feelings towards this what so ever. While leveling my baby warrior (gosh that sounds wrong!) 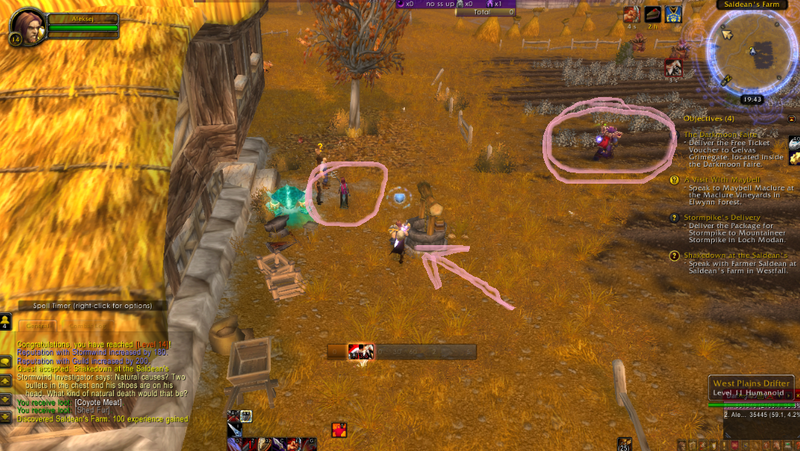 in Westfall, I encountered multiple people of the same level - that's a completely new experience for me, since I've never really played on a high population realm. My main realm, Moonglade EU, is medium populated, but often quite empty. Sharing the place with others didn't disturb my leveling in any way, as mobs also spawn at a faster speed - that seems to be something certain people worry about. I think cross-realm zones are a grand thing. P.S. I noticed that Molten Core core hounds are back to their normal size!